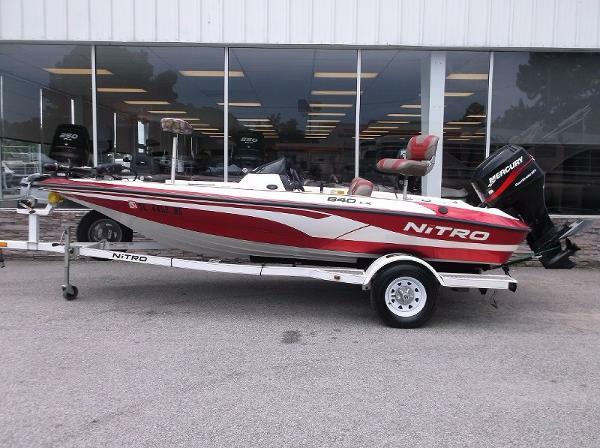 2004 Nitro 640 LX At Nitro, we think everyone should get the chance to ignite their passion for fishing. 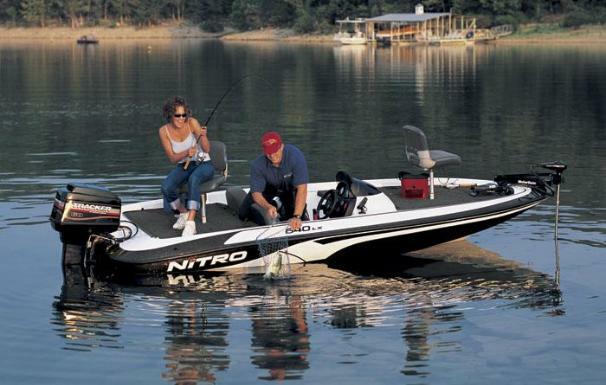 That's why we've worked extra-hard to create the most affordable boat in our entire line - the Nitro 640 LX. 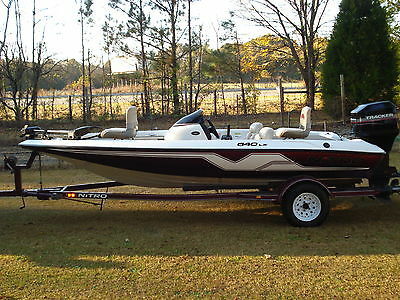 This great-looking boat is loaded with everything you need for endless days on the water. 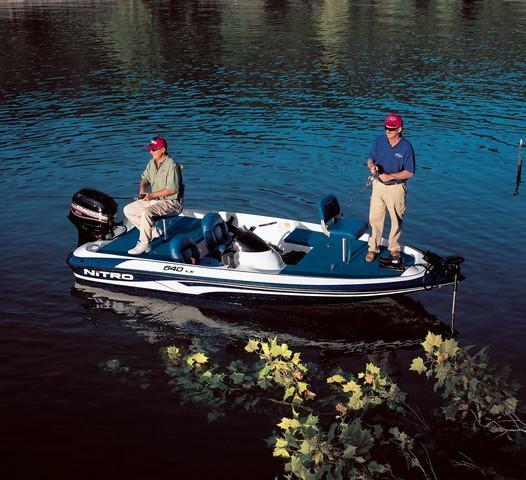 MotorGuide trolling motor, two rod lockers, storage with drop-in boxes and locking lids, a divided livewell with rounded corners and aeration system. 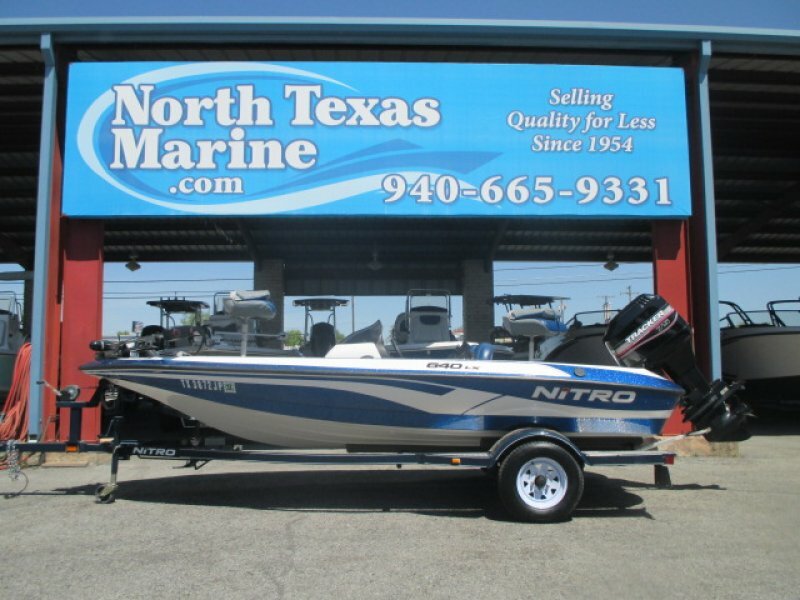 2008 Nitro 640 LX End of summer savings!!! 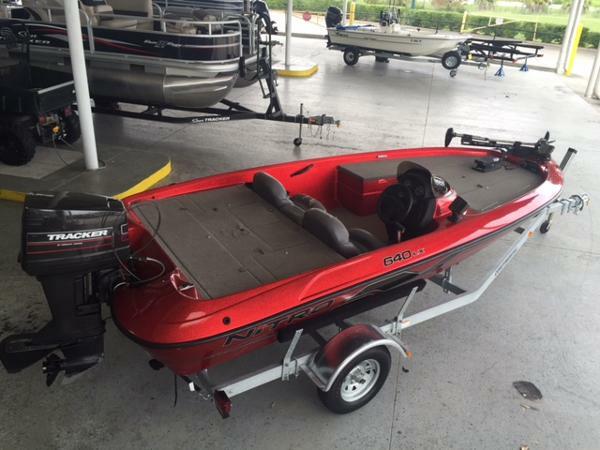 This Nitro comes equipped with a Motorguide 46 lb. 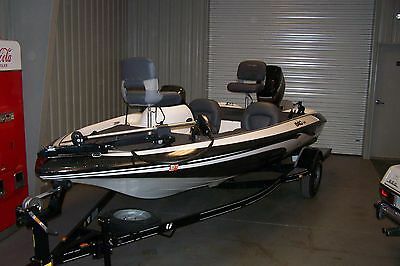 thrust trolling motor, a Humminbird 717 fish finder at the console, a Lowrance X47 at the bow, 2-bank battery charger, boat cover, and a spare tire! Call today for more details! 2000 Nitro 640 LX Print this page. 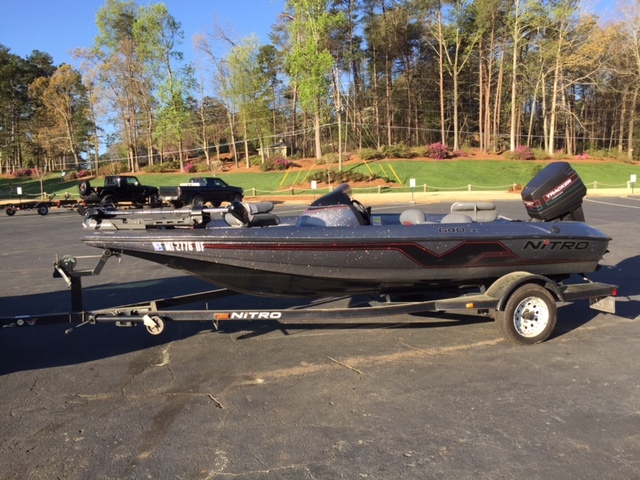 Nice clean Nitro 640LX with 75hp 2 stroke Mercury 16 foot bass/fishing fresh water use Georgia boat and matching trailer with lots of features. This is a lake ready unit and we spent close to 1k on service and batterys to make it that way! New battery's, new plugs, fuel filter, impeller, lower out drive serviced, rebuilt carbs compression checked and is great 2018 Georgia registration done and much more! 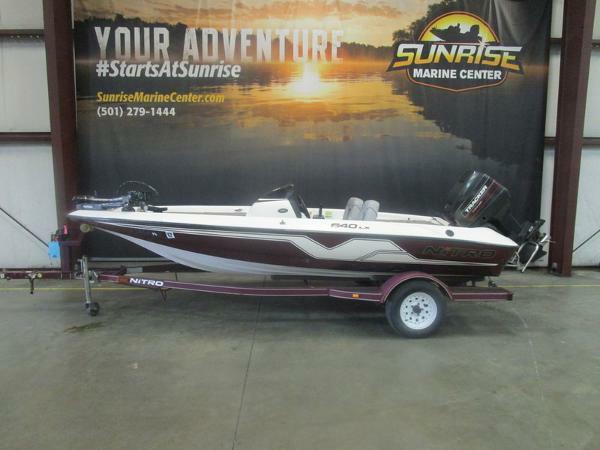 It has seating for 4, live well, fish finder, power tilt/trim, am/fm radio, trolling motor, spare tire, rod holders, lots of storage wells and more! 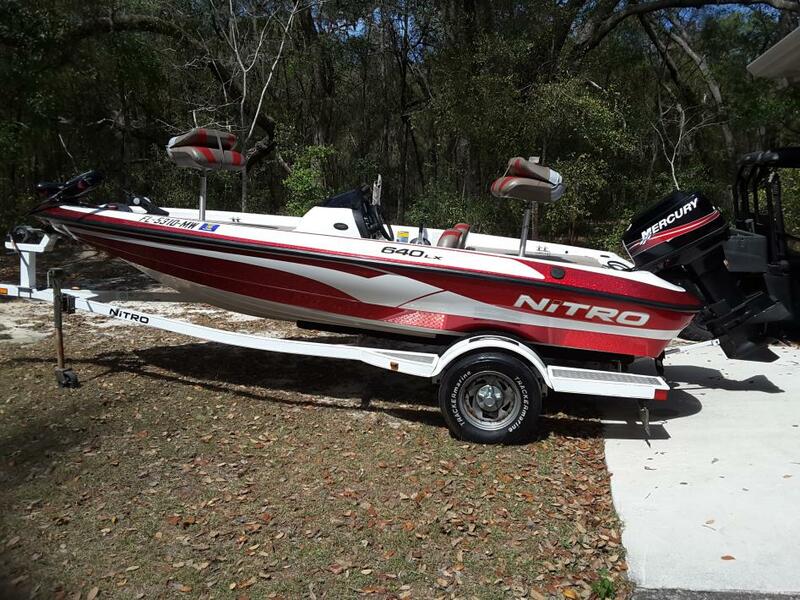 Boat and trailer are parked in our showroom it is that nice please call ahead to set up a time! FYI: BUYING OVER THE INTERNET SHOULD BE A THRILL WHEN YOU HAVE THE RIGHT SOLID SELLER LIKE US... AND THE RIGHT VEHICLE! SO TO MAKE THIS LISTING INTERESTING & FUN.... WE HAVE SET THE STARTING BID AT WHAT WE FEEL IS FAIR. IF YOU HAVE ANY QUESTIONS ON THAT PLEASE CALL US AT DEALERSHIP 770-345-0282 TO DISCUSS. 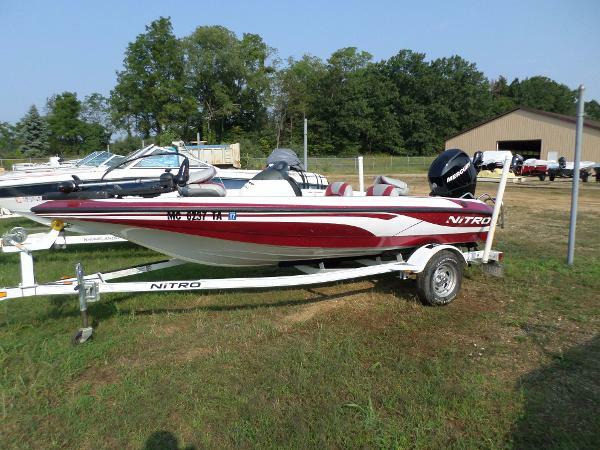 This one is loaded with features so check out equipment list in ad! Also you can view my other listings going on right now for more great finds by simply looking in my ebay store and clicking on the tab marked ebay store in the right hand of this listing! 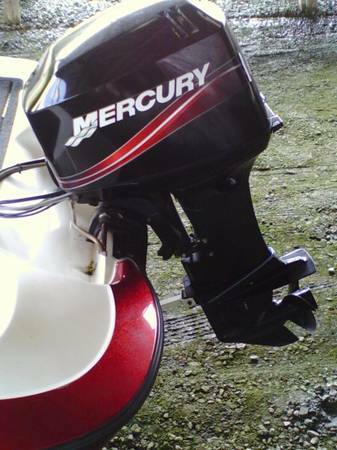 The decals, plastics vynal and paint on this boat are in good condition. This boat looks to have never been abused. Garage kept. Transmission shifts smoothly. The engine is mechanically strong. Electrical systems are in working order. Clean body. 90% tread life left on the tires. Seats condition are excellent. Take a moment to visit my ebay store by clicking on the tab in top right of this listing to see the many other vehicles we have listed right now on ebay! If you have any questions about this or any of my other auctions please feel free to contact me via e-mail or you can call me at the toll free number 1-888-239-5077 and if that is busy please try us on our local # 770 345 0282. Thank you for your interest and we look forward to hearing from you you can ask for David Mosley or Danny Ryder! PLEASE SEE OUR TERMS OF SALE BELOW! WE CAN ASSIST AND TAKE CARE OF SHIPPING THIS VEHICLE AT NEW OWNERS EXPENSE THRU-OUT USA AND WORLD WIDE WITH PROPER INFO AND HELP FROM INTERNATIONAL BUYERS JUST ASK AND WE CAN FACILITATE IT FOR NEW OWNER! PLEASE REALIZE WE ARE SHIPPING BROKERS AND WILL HANDLE THIS FOR NEW OWNER AS QUICKLY AS POSSIBLE! IF YOU ARE NEW TO EBAY OR HAVE POOR FEEDBACK PLEASE SUBMITED YOUR CONTACT NUMBER SO WE CAN CALL YOU TO DISCUSS HOW YOU WILL COMPLETE TRANSACTION. ALSO REVIEW THE MANY PHOTOS ON THIS BABY I DO THIS UP FRONT UNLIKE COUNTLESS OTHER ADS YOU WILL COME ACROSS. THIS EFFORT IS MADE SO BUYER CAN MAKE A GOOD DECISION ON GETTING HER AND FEEL COMFORTABLE WITH THERE PURCHASE. 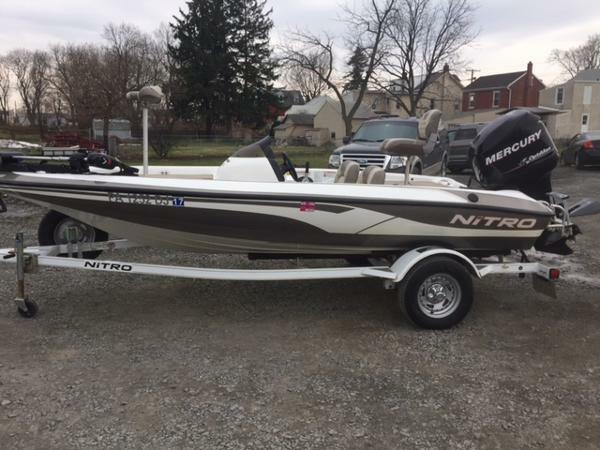 I WILL PUT IN THIS DISCLAMER FOR THE 1 PERCENTER NUT'S THAT THINK THEY ARE BUYING A BRAND NEW 2000 BOAT....THIS NICE NICE CONDITION & WELL KEPT ONE AS YOU CAN SEE AND NICER THAN MOST ONES OF THIS VINTAGE BUT PLEASE REMEMBER IS NOT BRAND NEW. IT IS USED AND 15 YEARS OLD. 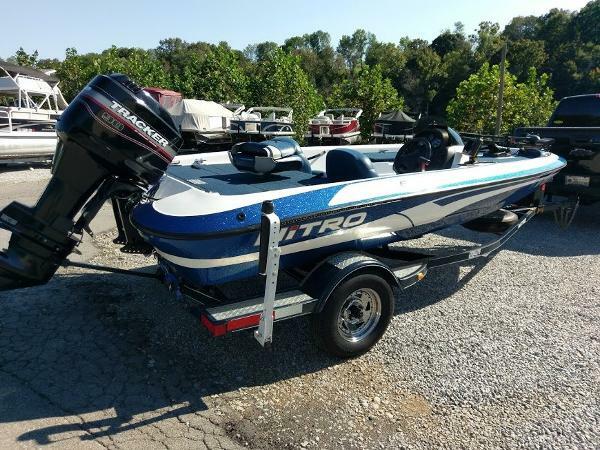 PLEASE BE REALISTIC WHEN BUYING A USED BOAT IF YOU WANT A PERFECT NEW ONE AND IF A FLAWS, SCUFFS, WEAR, FADES, PINGS, DINGS OR USE THAT SHOW ON A 15 YEAR OLD BOAT THAT HAS BEEN USED KEEP YOU UP AT NIGHT PLEASE BUY A BRAND NEW ONE AND NOT THIS NICE DECENT QUALITY 2000. PLEASE REVIEW MY FEEDBACK AND SEE I HAVE SOLD OTHER HIGH DOLLAR ITEMS AND NOT A BOX OF KLEENEX OR WAX CANDLES AND TELL IT LIKE IT IS FOR NO DISAPPOINTMENTS. PEOPLE ARE PLEASED WITH MY REPRESENTATION PERIOD. PLEASE ASK YOURSELF A QUESTION WHY FIX UP AN OLD SLED BOAT WHEN YOU CAN ENJOY AND USE THIS ONE NOW AND SAVE BIG IT DOES MAKE SENSE! WITH THIS ONE BEING SOLID NICE AND CLEAN! MAKE IT ONE TO SNAP UP SHOULD NOT LAST LONG AT THIS DEAL. WarrantyAS IS - NO WARRANTY This vehicle is being sold as is, where is with no warranty, expressed written or implied. The seller shall not be responsible for the correct description, authenticity, genuineness, or defects herein, and makes no warranty in connection therewith. No allowance or set aside will be made on account of any incorrectness, imperfection, defect or damage. Any descriptions or representations are for identification purposes only and are not to be construed as a warranty of any type. Please realize you are buying a used vehicle and repairs will be part of your ownership and not our responsibility or liability to help you with these costs no matter when and if they happen. It is the responsibility of the buyer to have thoroughly inspected the vehicle, and to have satisfied himself or herself as to the condition and value and to bid or buy based upon that judgement solely. 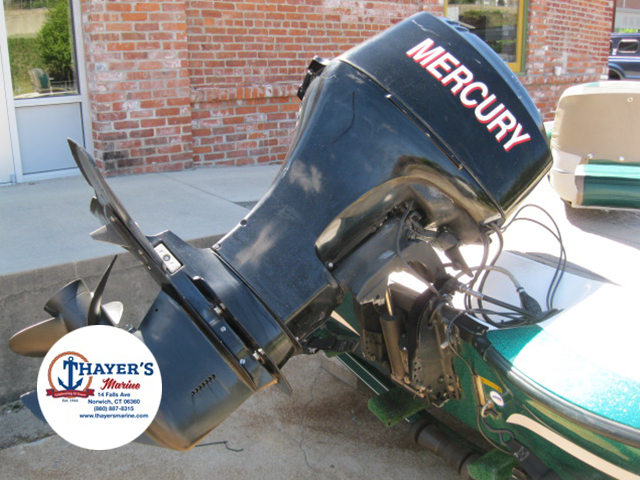 Any 3rd party inspections will be done at sellers location before auction or listing close. Seller assumes no responsibility for any repairs regardless of any oral statements about the vehicle. These statements intend to cover the many methods that a very small minority of buyers may could use to try to take advantage of our ethical business practices if not covered up front. Buyer of this vehicle agrees to the terms of this as-is sale buy bidding or buying. About Us: We love vehicles! No matter if it goes by land, sea or air we are into them! This business is truly our passion and I thank the good lord above we are doing what we love! It just does not get any better really enjoying your job! We do things quite differently. We are not just your typical dealer with a small patch of gravel and mobile office! We have a state of the art 11000 square foot dealership with an indoor showroom and are very customer service friendly! We have over 20 years experience in the automotive industry so we know how to take care of customers and details and through the process treat you right just give us a try and see! We are here to stay and not some fly by night sled runners! Terms & Conditions: If you are new to ebay and have a 0 next to your user name or if you have bad feedback please contact us before you bid with your intentions and full contact info so we can be assured you are familiar with on line bidding and assure us you realize you are bidding to purchase. If you choose not to do this we have no choice but to remove and block you from bidding. We fully realize we have to start somewhere feedback wise and there are bumps in the road. So if you are a reasonable person you will know where we are coming from so please comply and do as we ask. Winning bidder please contact us within 24 hours of auction end and let us know how and when you plan to handle completing your purchase. We do not guarantee any other state/providence inspections required by your DMV other than the ones required by our state of Georgia. It would be very unrealistic for you the buyer to assume that we have knowledge of your States/Providences inspection requirements. $500.00 non refundable deposit is due within 24 hours of end of auction. Pay Pal is preferred but you can easily over night a verifiable cashiers check or money order. The remainder is due within 5 days of auction end. If no contact is made within 24 hours we reserve the right to re-list the vehicle, sell it to the next high bidder, or sell it otherwise. Something you should be aware of! Most banks and credit unions do not finance vehicles older than 2002's or with more than 100K miles. However a lot of lenders may loan the money on you and not just the vehicle if you have a good relationship with them but please do us all a favor and make sure if financing your purchase that your financial institution accepts you the vehicle, year and miles of this unit before bidding that all should be understood but please get all that squared away prior to bidding. Buyer is responsible for pickup or shipping of this vehicle. She is located in Canton Ga 30115. We can keep vehicle at our location for up to two weeks at after sale date if you need longer than this time we will try to work with you. If no pre arrangement has been made there will be a $20 per day storage fee added after this time. If you wish to have it shipped using a service, we will gladly cooperate with your shipper on a time that's good for them and us! We deal with shippers all the time and know how to get the pick up squared away and yes a large 18 wheeler can access our facility. You can get a shipping quote by contacting us and we can arrange shipping for you! If you are not sure about something, please ask! Do not assume anything not listed is included. We reserve the right to cancel bids for excessive negative feedback. We reserve the right to end the listing if the vehicle is no longer available for sale. Please do not bid on this auction unless you are serious about owning this vehicle. We are very familiar with the laws about on line bidding so you know this is a legally binding contract and non paying bidders will be held responsible in case of an auction default and the costs incurred, and negative feedback will be posted. Any disputes over this transaction will be handled thru a third party binding arbitration in Cherokee County Georgia. Winning bidder agrees to our terms and conditions by bidding on this auction. Fees and Tax Information: We are a licensed and bonded Georgia dealer. As of March 1st 2013 no matter if you purchase a vehicle from an individual or dealer and you are a Georgia residence and vehicle will be reg in Georgia you the buyer are required to pay the new TAVT "Title Ad Valorem Tax" this fee is based on the vehicles percentage value that the Department of Revenues est value.... here is a link for you to calculate the TAVT amount. http://onlinemvd.dor.ga.gov/TAP/vinnumber.aspx Vehicles purchased on or after March 1, 2013 and titled in this state will be exempt from sales and use tax and the annual ad valorem tax. Instead, these vehicles will be subject to a new TAVT that is based on the value of the vehicle as outlined above. On non titled vehicles we will collect sales tax on your county in Georgia that is either 6% or 7%. We are required by Georgia dmv to process your title when required for Georgia residence in your name so please have a current Georgia licence with a good address so you will receive title from state the fee the state charges is 18.00 for this. A 25.00 emissions fee will be added for Georgia residents only when required if you live in an emission required county. We have a 169.50 document fee. The document fee is for everyone including dealers added to all final winning auctions once res is met or accepted price that is less than our locally advertised price! Out of state buyers will pay their own tax's and fees in there own state. The 169.50 document fee will be included in our advertised listed pricing and "buy it now" ebay price. We do not collect other states tax or fees, that is something you will take care of when you reg and title your new ride! So all out of state buyers are required to pay is winning auction price and document fee that includes 30 day temporary tag fee as stated above.